Dr. Mohammad Ismail Memon Madani’s most recent publication, entitled The Ramadan of Shaikh al-Hadith Muhammad Zakariyya and our Elders, is a most welcome addition to an ever-growing library of quality English Islamic literature. I received the book only days before the end of Ramadan and was so excited to read through the first few chapters that I hurriedly finished it before the ‘Id dawn. Having completed the book, my only regret was not having had the chance to read through it before the advent of the holy month. The book is essentially a narration of scores of anecdotes from the many Ramadans of Shaykh al-Hadith Muhammad Zakariyya al-Kandhalwi’s (may Allah have mercy on him) life, in particular those in which the author – Dr. Ismail Memon – was himself able to participate or document. The stories found within the book are astonishing. What the mind only imagines was possible in the time of the early Muslims, Shaykh al-Hadith is able to enact them in this day and age. In this sense, the book is not only an encouragement for the modern Muslim, it is also a testament to the applicability of the pious ways of the salaf in our very day. Although the book is a pleasantly brief 170 pages and thus an easy read, I put down the book craving more. It is unfortunate that so few books that vividly document the noble lives of Muslim pious sages of the near past, with a focus on their piety and character, have been translated into English in recent times. Rather than focus on the political biographies of the scholars, this book highlights the awe-inspiring spirituality and astounding piety that scholars only a few decades past were able to exhibit to their students, many of whom are still alive today. Despite the book’s dominant narrative style, several places provide clear and practical advices for the everyday Muslim. This is especially important given the intensity of Mawlana Zakariyya’s devotion to ritual worship, an intensity most of us can never hope to achieve. For example, Shaykh al-Hadith was known to recite an average of 32 juz’ of the Quran daily in Ramadan, six juz’ of which were recited in tahajjud and three during the sunnahs of zuhr prayer! Amongst the practical advices provided in the book is Shaykh al-Hadith’s booklet of daily devotions, given in the eighth chapter, which provides a comprehensive list of daily deeds to practice as a seeker of the spiritual path. 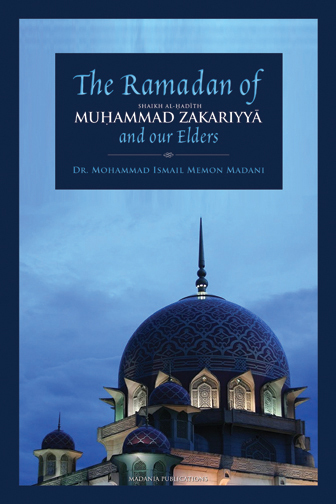 Most enjoyable about the book is that it does not limit itself to Mawlana Zakariyya’s Ramadan practice but also provides several chapters on the Ramadan of other elders, reproduced from Mawlana’s own book entitled Akabir ka Ramadan. The list of the elders includes Imam ‘Abd al-Qadir al-Dihlawi, Haji Imdad Allah al-Muhajir al-Makki, Shaykh Rashid Ahmad al-Gangohi, Mawlana Muhammad Qasim al-Nanautwi, Imam Khalil Ahmad al-Saharanpuri, and Shaykh Husayn Ahmad al-Madani amongst others. These chapters are attached to the work as a separate book and are truly so valuable as to deserve a separate printing. Although the first print of the book contains a number of typos, I was assured by the publishers that the mistakes found within were due to a desire to quickly print the book before Ramadan and that subsequent editions will have them edited out. Regardless, the occasional and easily-recognizable typos are minor and do not distract from the book in the slightest. Like Madania Publications’ other works, the book is visually pleasing and includes excellent typesetting. The cover and pages are printed with quality paper. In brief, a quality work and a must for every household, especially before the auspicious month of Ramadan.